A Google Account is one account from Google to access all the Google products. In a Google Account one username and one password is for all the services provided by Google like Gmail, Google+, Maps, Youtube, Calender, Docs, Drive, blogger etc.. Many says it as Gmail Account or youtube account also. But these are only the part of a Google account. 2. Click on “SIGN IN” on the top right corner of Google. It will open a page where we can log in to our old Google account. 3. As we need to create a new Google Account, So again click on “SIGN UP” on the top right corner of the open page. 4. It will open the page for new Google Account creation. (https://accounts.google.com/SignUp). Your Name: First name and the last name. Choose your User Name: Ask you for a user name to access the new account. The user name must be unique. If one user name is taken by anyone else then you can not choose the same user name. This user name will be used as a email id in Gmail. You can also integrate your old email id to access Google product by choosing “I prefer to use my current email address”. Create a Password: Create a passwoord for the above user name. It will be used to login for the google product. You can also change it later. Confirm your password: Confirm you rpassword by entering it again. Birthday: Enter your date of birth so that your age will be calculated and accordingly restriction will be given on the Google product. Gender: Choose your Gender whether Male/ Female or other. Mobile Phone: Enter your Mobile Phone. It will be used to verify your account and reset the forgotten password. Your Current Email Address: you can also leave it blank if you don’t have a email id before. Prove you are not a robot: This is only to check that you are a human being. Just Enter the captcha or skip it to verify yourself using our mobile phone. Location: Now choose your location. 7. Click on “Next Step“. 8. If you prove yourself that you are not a robot by entering captcha. Then the next step will come. Otherwise it will ask you to verify yourself using your mobile number. 9. You will get two option of SMS or voice call to verify your account. Choose anyone and click on “Continue” to receive the verification code on your given Mobile number. 10. After receiving the verification code on mobile. Enter it on verification page and click on “Continue“. 11. Now the Google Account is created. 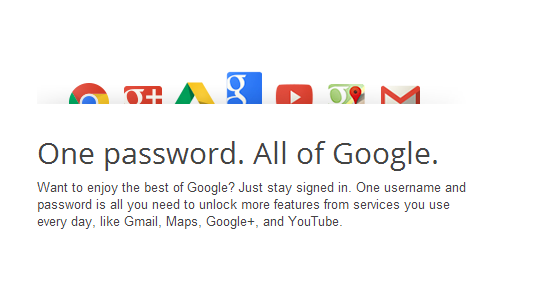 Click on “Get Started” and access all the Google products on your desired username and password.